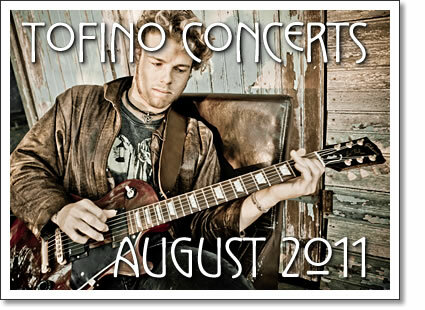 The following concerts in Tofino are happening in the month of August 2011. Tickets for shows at the Tofino Legion are available at Tofitian and Long Beach Surfshop in Tofino. Tickets for events at the Maquinna Pub are available at the door. ﻿Deekline is that rare figure in dance music, the seminal producer who has successfully maintained underground cache while making regular raids into the mainstream. Deekline is just as content jetting off to distant corners of the globe to bring his booty-shaking, genre-straddling style to fresh audiences as he is shutting himself away in his London studio to lock down the latest heavy jam. Witnessing this groundbreaking DJ do his thing in the flesh is a rare, genuine must-see experience: a chance to catch a figure right at the apex of the thriving indie-dance scene. This is an artist who’s always ahead of the game when it comes to the latest sounds, and generally most comfortable when confronted with a set of turntables and the chance to get his scratch on, usually to the delight of the crowd. ﻿Oka is a celebration of Australian cultures, sinking deep into the roots of the Asia Pacific region. The oka sound is deeply rooted in the laid back coastal style of their down under home. Their signature is a smooth hi-fidelity sound that is full of beautiful uplifting melodies, tones and textures cooked over raw didgeridoo rhythms and phatt dance driven grooves. A live collective where no two gigs are the same, the oka flavour is their own hybrid of feel good Roots, Reggae, Dub and Jazz, marinated in Electronica and served on Island Time. oka hypnotic, high energy live performances are a spontaneous exploration into the sublime. Kim’s style is explosive, with intricate fingerpicking, percussive beats on the body of the guitar, and two-handed tapping intertwined with an earthy stomp box, powerful harmonica melodies and soulful voice. His songwriting reflects his coastal lifestyle - growing up on the East Coast of Australia, with the surf at his front door - and his new nomadic life on the road. Kim Churchill is a live spectacle and a true virtuoso but unlike so many others who could be labelled as such, he transmits a vibe of genuine modesty. Perhaps his other love, surfing, keeps him grounded. Though his playing is often complex, his songs have an easy, natural flow that certainly reflect the peace of mind that rolling waves and a rising sun possess. Tofino concert listings from Tofino Time Magazine. Shows at the Tofino Legion and other music events in Tofino in August 2011.